Currently viewing the tag: "racism"
Kamal Al-Solaylee, Angelyn Francis and Jim Rankin discuss how reporters can get comfortable while covering controversial stories at an RJRC panel. Photo: Madeleine Binning. Young journalists – and even industry veterans – can feel uncomfortable reporting controversial stories on topics like race, gender and LGBT issues. Some may even shy away from reporting on these topics to avoid the social media blowback that could follow. The first RJRC event this fall, the panel attracted about 100 journalism students, faculty members and members of the public to the Rogers Communication Centre at Ryerson University. 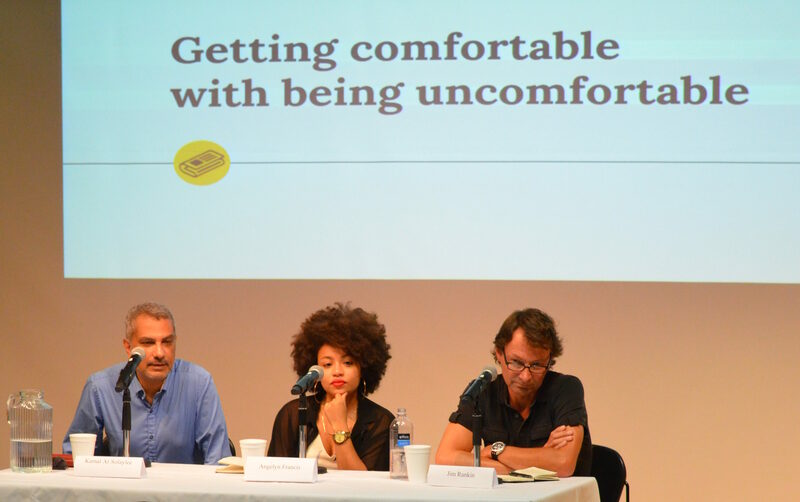 The discussion, featuring Rankin, award-winning author Kamal Al-Solaylee and Angelyn Francis, associate editor for The Huffington Post, focused on how journalists can deal with discomfort while reporting on controversial issues and the importance of covering difficult topics. The key to covering such stories is taking the time to get to know sources and neighbourhoods, Rankin said. “If you go into the community, spend time there, gain trust, don’t go in with your cameras blazing. Take time to get to know people – that’s the way that you establish relationships,” he advised. He said that it can be difficult for reporters to know they’re on the right track when reporting on unfamiliar groups or places and suggested it helps to have a contact inside the community, even if the source won’t be directly quoted in the story. These community insiders can also be used to test whether a story is accurate and to follow up on stories later, he said. “Don’t just leave a story that’s an important story and walk away,” he advised. Al-Solaylee, a professor at the Ryerson School of Journalism (RSJ), said that he travelled to 10 countries to write his recently published book, Brown: What Being Brown in the World Today Means (to Everyone). “Being in the world that you wish to write about, that you wish to cover, is, to me, the most valuable thing,” said Al-Solaylee. He said that one challenge he faced while researching his book was writing about people that he often had “nothing in common” with. Because, as he explained, he was interviewing construction workers, temporary workers and domestic workers from a place of “privilege” as a university professor, it was even more important to him to see their experiences firsthand. Francis, a recent graduate from the RSJ and currently a freelance journalist, stressed that that it is important to tell difficult stories. “Because of the racial tensions in the United States, Canadians are too quick to write off the fact that racism exists in Canada,” said Francis, who was involved with multiple student groups such as the Racialised Students’ Collective during her time at Ryerson. She also urged journalists to do their homework and thoroughly research the topics they cover. Author and Ryerson School of Journalism professor Kamal Al-Solaylee discusses his latest book with The Globe and Mail’s Doug Saunders. When Kamal Al-Solaylee saw a group of Filipina maids enjoying a picnic in a Hong Kong park during their time off work one Sunday afternoon in 2011, the concept for his next book began to form. That idea solidified when, back home and riding the subway in Toronto, he again saw a large group of Filipina workers talking together and realized that both groups, though an ocean apart, shared two things in common: their work and their skin colour. 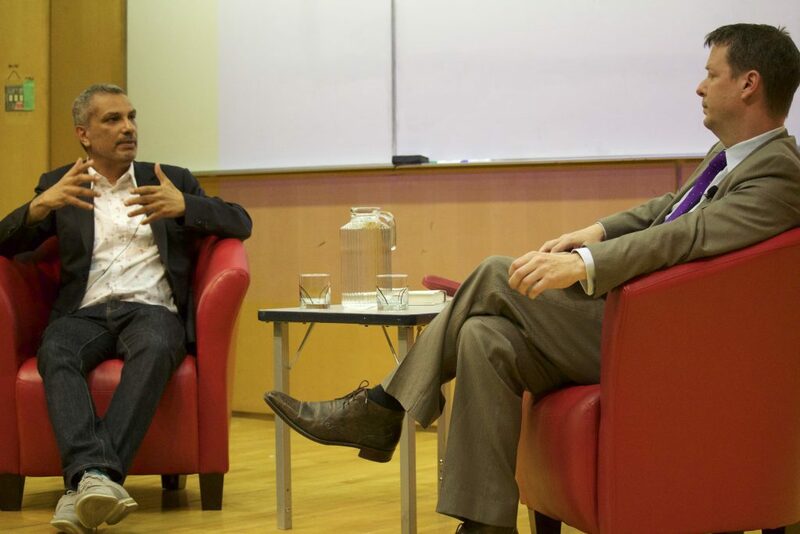 Al-Solaylee discussed his latest book, Brown: What Being Brown in the World Today Means (to Everyone) with The Globe and Mail’s Doug Saunders last week at an RJRC-hosted Q&A session. Brown explores the complexities and shared experiences of people with brown skin from around the world. Al-Solaylee travelled to 10 countries and four continents over two years to talk with people from the Philippines, Qatar, the United Arab Emirates, Britain, Trinidad, France, Hong Kong, Sri Lanka, the United States and Canada about their experiences living as brown-skinned people in the world today. The book examines issues such as immigration, work conditions, economic marginalization, racism, Islamophobia, colourism and self-perception, all the while asking what experiences unite people from vastly different countries, cultures and backgrounds who all share one common trait: their brown skin. He found that brown-skinned people – particularly immigrants – often end up as transient labourers stuck in precarious jobs. This is true throughout the world, Al-Solaylee explained. He visited a school in Manila that trains students in housekeeping and the culinary arts so that they can work abroad. He talked with Filipina domestic workers about dealing with racism and segregation in Hong Kong (a country where foreign domestic workers make up five per cent of the population). And he met with foreign construction workers in Qatar, where, on average, one migrant worker per dies per day building the country’s infrastructure. Al-Solaylee and Saunders discussed how these labour disparities are also found in Canada. “We bring in a population (of new Canadians) that tend to have university degrees or are professionals, but we end up sacrificing them,” said Saunders, who wrote Arrival City: The Final Migration and Our Next World and The Myth of the Muslim Tide: Do Immigrants Threaten the West?, both of which explore immigration issues in Canada and elsewhere. Al-Solaylee was born in Aden, Yemen and grew up in Cairo and Beirut before pursuing an education and journalism career in the United Kingdom and Canada. He wrote his first book, the award-winning Intolerable, about his decision to leave his family in the Middle East to seek greater freedom and safety as a gay man in the West. Al-Solaylee said that writing the book was easy compared to the challenge of finding people who would talk to him, particularly in developing countries. “You arrive somewhere after people have promised to help you and then they disappear, or when you arrive you realize that they aren’t that much help at all,” he said. He said he ended up relying on NGOs to introduce him to potential interviewees. “When you meet just one generous person in every destination who is willing to open doors for you, that’s the most important thing,” he explained. Nonetheless, he still had difficulty finding people in Qatar willing to talk on-record about the country’s treatment of migrant construction workers, and was unable to find any dermatologists in Canada willing to talk about selling skin-lightening creams and treatments. In addition to recounting the experiences of brown-skinned people from around the globe, Al-Solaylee also tells his own story in Brown, and discusses identity and intersectionality between race and sexuality. His book begins with a memory of himself as a 10-year-old boy in early 1970s Cairo, excited to watch a premier of the British musical Oliver! on TV. But while watching the show, he noticed that the young, white-skinned actor did not look like him, and felt shame over being brown. He noticed that all of the ads and shows on Egyptian television that always used light-skinned actors and began to wish that he, too, had lighter coloured skin. He also discussed his experience feeling invisible as a person of colour in Toronto’s gay community, but he said that finding a Latino gay bar in the city also gave him a new sense of community. “It was the one place on Church Street where I felt completely at home because there were about 100 brown people around me and I was just one of them,” he explained. Al-Solaylee said that he was particularly upset over the shooting at a LGBT nightclub in Orlando, Florida earlier this month and how the news media identified the victims. The nightclub, Pulse, was having a Latin night, and the majority of the 49 people killed were Latin, Hispanic and black, but the media has not identified this as an attack against people of colour as well as an attack against LGBT people, he said. Racism, prejudice and “othering” is also an experience that unites people with brown skin, Al-Solaylee said.